T Type racing this year continues in the Iconic series racing with other 50s sports cars. There is a total of 14 T Type cars but in practice there is normally around seven or eight which take part in each race. The T Type/Iconic race will be on the Saturday 30 April at Brands Hatch and on the Saturday of MG Live! More MGAs will be joining in the series and overall there is the making of some excellent and varied grids. Especially this year at MG Live when the racing is being joined by some American racing specials from the 50s – fast in a straight line, the corners should be more interesting! They have a race programme for Europe and may also come to MG Mallory. Abroad there is the Bressuire Grand Prix – a great thrash round the town centre on 25/26 June, and the established Etretat hill climb near Le Havre on the 27/28 August. So if you are on the continent drop in – there are always T Types competing. Currently one very interested racer would like a TC to race so if anyone knows of a car please let Jonathan Harmer know. 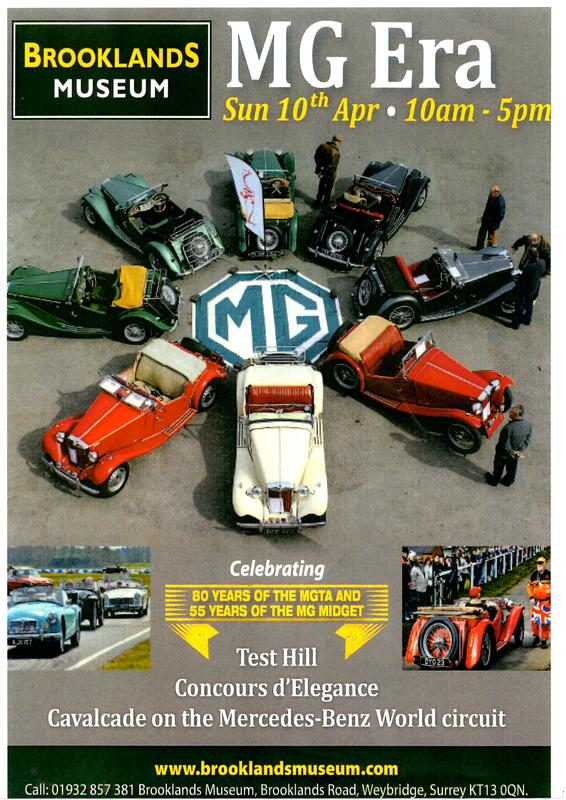 The Brooklands Museum in conjunction with the MGCC South East Centre will feature the 80th anniversary of the TA at this event. The Museum has asked us to help organise a display featuring the TA and any of its derivatives in their main paddock area. The Museum has requested ‘as many TAs as we can get to fill the paddock area’. That means getting 30+ vehicles there. Brooklands are relaxed about strict TA specification conformance and they would be happy to include any XPAG/TAs, TBs, and especially any racers or specials loosely based on an original TA chassis. Alan Wakefield has volunteered to contact TA owners who would be willing to bring their TAs, and especially any variants such as Tickfords, to Brooklands as part of the display and would like to receive expressions of interest from prospective display vehicle exhibitors. There will a concessionary entry charge for non-BMT members who are on the display list. The TA display cars will also be invited to participate in the Cavalcade run around the neighbouring Mercedes Benz test circuit, and, optionally, drivers can blast their car up the famous Test Hill. Attendance at the event is not restricted only to the TA display cars. We also want to see the usual fine turnout of all other T-Types who will parked up together in the adjacent areas. You can contact Alan at wakefieldalan@aol.com, or text to 07831618520, or phone 01932873170. The poster on the right is Brooklands’ A5 flyer for the event and has attracted considerable interest so that they are producing artwork for it as an A1 size pdf file for ‘distribution’. More info on how to get it when we know more. 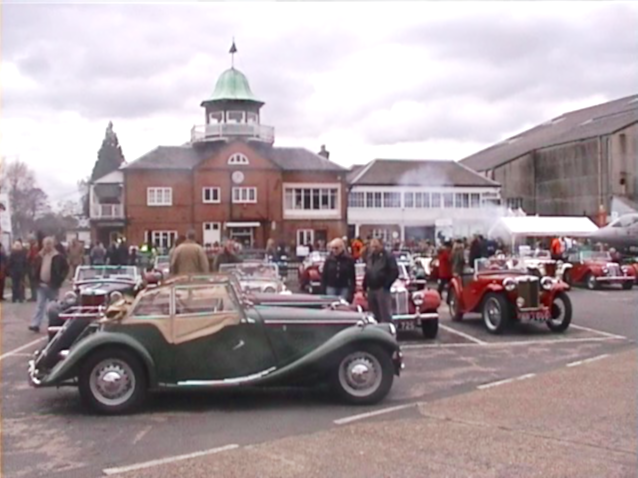 This year’s T Party will be held at the Flywheel event at Bicester Heritage on Sunday 3 July. The festival itself is being held over 2 days, but we have arranged to attend on the Sunday. Bicester Heritage is a relatively new concept and organisation based at the old RAF station at Bicester, but one which has received wholesale acceptance by classic car people in a very short space of time. This year will be the second year the Flywheel event has been held and already there are 16 car clubs signed up to go – and that now includes ourselves. We will have a designated space in the Display Area and the set entry fee for pre-registered club members will be £23 which includes car, driver and one passenger. There is a Flywheel web page for registering for the event. This is a dedicated page for ourselves and members of other clubs attending to get discounted tickets. After you have selected your tickets and display parking passes and pressed the ‘Continue‘ button you get taken to a page where you input your name and address details, car details, and are presented with a drop-down menu of motor clubs from which to select our club name and then complete your order. Please note, do not go to the general motor clubs page on the website which lists all attending clubs, complete with links out to the clubs’ websites – that is something quite different! Make sure you choose the Sunday option AND choose a ticket for displaying your T Type. The latter is at no cost but if you don’t, you will be directed to the public parking. Make sure you choose the correct car club during the process as the form is for all registered classic car clubs attending. During the purchase process you will be asked to give vehicle make/model etc, regardless of whether you require a display parking pass or not. You should insert your car details if you are coming in your T Type, or put ‘N/A’ if you are not. Bookings close at midnight on Sunday June 26th 2016. You will also receive a free souvenir programme for each adult ticket booked to be collected at the event. Our apologies for the long-winded instructions but we have been told by Bicester Heritage that some T Type members have been going to normal ticket booking page which doesn’t give them access to the club offer. You see more info about Bicester Heritage on their website. This year the Autumn Tour goes to Dorset to the George Albert Hotel midway between Dorchester and Yeovil on the A37. The hotel is privately owned and has 39 ensuite rooms which have been block-booked for the weekend. They have all now been taken. It is possible there may be late cancellations so there is an option of the reserve list. B&B accommodation is available – and even camping on an attached site if you’re of the hardy type. The hotel is well situated with a number of sites and venues all close by, such as Montecute House, the Haynes Motor Museum, Yeovilton Air Museum, Forde Abbey Gardens to name but a few, so there is plenty to do and see as well of course as doing the runs on the Saturday and Sunday. Geoff and Annie Matthews are organising the event and Chris Sundt is plotting the routes. Contact them at geoff@ostlersbarn.co.uk or ring them on 01840 214972.